Technological trailblazer Bend Research Inc. is continuing to lead the way in pharmaceutical industry innovation with the completion of a new commercial manufacturing facility poised to expand its scope for ever more sophisticated and efficient medicinal delivery methods. Parent company Capsugel – a global leader in delivering high-quality, innovative dosage forms and solutions – has completed construction of a new spray-dried dispersion (SDD) plant at Bend Research’s burgeoning complex off Builders Court in NE Bend, representing the final phase of a two-year, $25 million investment to expand commercial manufacturing capabilities at the site. SDD has emerged as a broadly applicable technology for enhancing the bioavailability of poorly soluble drug molecules to improve the ease with which pills can be absorbed into the body. As part of Capsugel’s Dosage Form Solutions division since 2013, Bend Research is the company’s center of excellence for bioavailability enhancement, modified release, other technology platforms, and pharmaceutical Research & Development. The expanded facility, which has already created more than 20 new jobs in the past year, is expected to create an additional 20 full-time positions in the second half of 2015 and is designed to accommodate future capacity additions. Bend Research Vice President Tanya Hayden said the new multi-story commercial-scale 5,800 square foot facility allows Bend Research to expand its renowned drug development technology to include the final stages of manufacture, providing additional capability for the company’s growing customer base. Hayden said the move adds to existing infrastructure and science capabilities in pre-clinical and early clinical development. With this expansion, Bend Research provides an integrated offering for feasibility, development, late-stage clinical and commercial manufacture of spray-dried drug product intermediates, complementing the company’s proven 20-year track record with SDD technology and unparalleled experience in formulating more than 1,000 compounds. The state-of-the-art building – designed by local specialists Blaise Cacciola Architects and built by general contractor Kirby Nagelhout Construction Company, who are both long-time collaborators with Bend Research in its campus-style evolution – is itself a marvel of engineering efficiency featuring different levels of atomizing and drying equipment and employing cutting edge technology linked through several floors of a compact 50 ft tall building envelope. The latest 3-D building information modeling techniques were used to generate digital representations of the physical and functional characteristics of the new highly complex and creatively customized building, with the tool continuing to be employed as a useful “map” of the facility. As part of maintaining a supremely clean environment, processing rooms are also accessed through futuristic air locks as fresh air flow is precisely controlled throughout the facility to maintain optimal operational conditions. Following unveiling of the new facility, Capsugel Dosage Form Solutions president Amit Patel commented: “This investment reflects our strategy to leverage our science and engineering-based expertise to enable innovative dosage forms that improve the lives of patients and consumers. The new units use innovative dryer design and manufacturing plant technology to offer a significantly improved product throughput that minimizes cycle times and maximizes productivity. Since its inception in 1975, Bend Research has been noted as rooted in the fundamentals of science and engineering, but was not always a pharmaceutical-focused company. It originally started out involved in government research before branching out into the private sector and nurturing a number of innovative spin-off companies. By the early ’90s, an increasing collaboration with Pfizer saw the company eventually enter into an exclusive agreement with the pharma giant. During this collaboration, Bend Research became a pharmaceutical research company and advanced the development of SDD technology. Forward-thinking staff worked on pharmaceutical projects that were among the most challenging, and in 2008 Bend Research went non-exclusive – utilizing its know-how in tackling challenges faced by the pharma industry beyond the collaboration with Pfizer. With a growing client base, an era of alliances and partnerships began, with a renewed focus on advancing new medicines to commercialization. 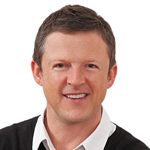 As programs advanced and capacity became strained, then Bend Research president Rod Ray – who currently maintains a position as Scientific and Business Advisory Board Member with Capsugel – realized the company had come to a point where it couldn’t grow any further without an outside financial investment, ultimately leading to the acquisition by Capsugel in 2013 – and tremendous growth thereafter. Capsugel is best known for the manufacture of hard capsules as the world’s leading provider of capsule products and services for pharmaceutical, OTC and health & nutrition customers, producing over 200 billion hard capsules annually for more than 4,000 different customers in over 100 countries. After spinning off from Pfizer in 2011, it wanted expand its vision beyond simply providing empty capsules to becoming a leading provider of dosage forms and solutions to healthcare customers around the world. Shortly thereafter, it launched the Capsugel Dosage Forms Solution division, with a focus on drug delivery technologies and global solutions for product development and manufacturing. 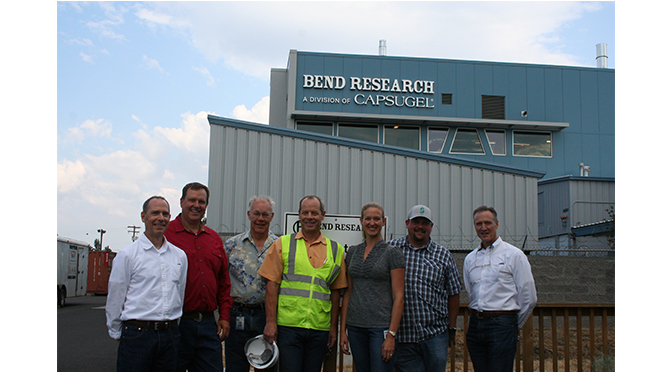 As part of the Capsugel Dosage Form Solutions business unit, Bend Research now has around 285 employees and is experiencing continual growth. 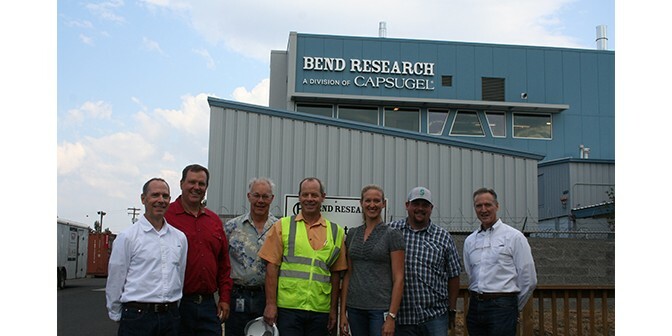 Bend Research Vice President Trevor Wigle added: “The new facility addition allows us to take things further down the pipeline and has resulted in hiring across the board. “We have also developed good relationships with institutions like Montana State, Oregon, Oregon State and Cal-Berkley universities, and have taken on numerous chemists out of the premier Oregon schools. “We have also been involved in working with the evolving OSU-Cascades campus locally in the potential development of specific skill sets suited to Bend Research, including discussing curriculum development in fields such as mechanical engineering and computer science. The expanded facility extends SDD commercial manufacturing capability with two high-capacity dryer process trains – one of which is designed to handle higher potency compounds – and is able to support manufacturing of batch sizes up to 300-plus kg powder or 2400 liters of spray solution, with several companies having already awarded Bend Research as the launch site for their new spray-dried dispersion products. Bend Research Director of GMP Manufacturing Ian Stout said, per strict industry standards, the facility can support a high level of containment including automatic doors, airlocks and highly cleanable surfaces. Airflow is also highly segregated, being brought in from the exterior and exhausted out of each area separately in a “single pass” configuration. The facility also includes a high level of automation and operator interfaces through multiple rooms – all with an overall goal of delivering higher quality products, faster. Hayden added: “As the industry seeks out better medicines, we find that many of the new drugs are faced with challenges related to delivery and absorption by the human body. “Our expertise and capabilities can help overcome those challenges, but the company has to continue to innovate and grow to keep up with the industry demand. Bend Research is a part of Capsugel’s Dosage Form Solutions business, providing access to additional technologies, R&D capabilities, and global manufacturing infrastructure for the advancement of client compounds from concept through clinical to commercial manufacture. For more than 35 years, Bend Research has worked with clients to create value by advancing new medicines that improve human health and to solve their most difficult scientific and technical problems. This success is based on the company’s ability to develop, advance, and commercialize pharmaceutical technologies, which grow from a solid base of scientific and engineering fundamental understanding. Bend Research is a leader in novel formulations, including spray-dried dispersions and hot-melt extrusions formulations, as well as controlled-release, inhalation and biotherapeutics technologies. Capsugel’s Hard Capsule business offers customers the broadest portfolio of gelatin, vegetarian, and other specialized capsule technologies. Capsugel’s Dosage Form Solutions (DFS) business utilizes an array of proprietary technologies and specialized manufacturing capabilities to solve customers’ most pressing product development challenges, including bioavailability enhancement, modified release, abuse deterrence, biotherapeutic processing, and inhalation formulation. The company’s fast-to-clinic program streamlines product development from pre-formulation through clinical and commercial supply for finished dosage forms. Headquartered in Morristown, New Jersey, Capsugel serves more than 4,000 customers in more than 100 countries.